The call followed a motion entitled: “Need to urgently save Eko Bridge, Long bridge in Fadeyi, Ojuelegba and National Stadium bridges from imminent collapse due to Parking by Tankers, Trailers, and other articulated vehicles in Lagos State” sponsored by Mr. Enitan Badiru (APC, Lagos) during plenary on Wednesday. Speaking on the motion, Mr. Badiru explained that the Eko bridge is one of the busiest bridges in the country with a vehicular traffic of over a million cars daily and links Lagos Mainland and the Island which is the commercial nerve centre of the country. the Apapa wharf, which is the nation’s number one sea port. Explaining further, Mr. Badiru said the bridges were not designed to carry such heavy trucks on daily basis not to talk of parking thousands of them permanently on the bridges. His words: “Our traffic laws forbid parking of any vehicle whatsoever on bridges, because it may lead to bridge collapse. And that all over the world, cases of bridge collapse since 1800 till date have been as a result of bridges carrying more weight over a period of time as against the initial designed weight. 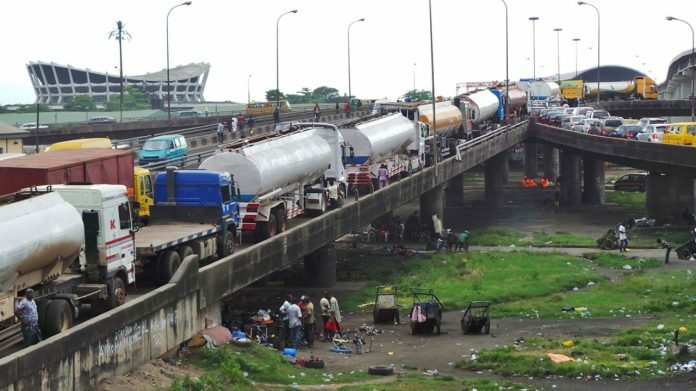 He said he is highy disturbed that the drivers have refused to use the designated parking areas and prefer to park on the bridges and that the security agencies who ought to enforce the traffic laws seem to have been overwhelmed by the sheer number of trailers, tankers and articulated vehicles. Speaking also about the security implications of having these trucks parked on the bridges at this period, the lawmaker hinted that hoodlum, miscreants and robbers are now using the opportunity of the traffic gridlock to perpetrate evil, and rob innocent citizens, motorists and commuters on daily basis especially at night. The motion however sailed through the House without debate owing to it being infrastructure related that does not allow for further debate on the floor. To this end, the House mandated the Inspector General of police and other Security agencies to, as a matter of urgency evacuate these heavy vehicles from the bridges and compel them to use parks established for them and prosecute those who float the order.